The head is arguably one of the most distinct features of vertebrates. Sensory organs accumulated into a mass at the front of the body over the course of evolution have now become a seminal feature of evolution. Protecting this vital organ is the skull, a bony structure that must closely encase the brain throughout its entire development—from embryo to adult. It seems only natural for the skull and brain to be closely connected to each other throughout development. How can two structures evolve as one entity? Recently, researchers at Yale formally mapped out this relationship between reptile and bird brain and skull roof development for the first time. “Mammals tend to be more popular to study in developmental biology because of their complexity compared to lower vertebrates like reptiles,” said Bhart-Anjan Bhullar ‘05, assistant professor of geology and geophysics at Yale. “But, because of the large size of mammalian brains, some fundamental structural relationships can become obscured.” In human embryos, for instance, the forebrain rapidly grows over smaller parts of the brain in the back of the head, making it difficult to track the relationship between the skull and brain during development. Reptiles and birds, on the other hand, have a clearer regions of the brain that correspond to certain regions of the skull, making it easier to track how the skull forms over parts of the brain. Through combined approaches in fossils research and developmental biology, researchers have been able to show for the first time that the growth and evolution of the brain has also triggered corresponding changes in structure and shape of the skull for millions of years. In order to understand how the brain and skull work together, the fossil record can help distinguish how skull is separated into different parts that correspond to different parts of the brain. “The brain has three partitions in all vertebrates: the forebrain, midbrain, and hindbrain,” said Matteo Fabbri, graduate student and lead author of the published paper. “These partitions enable embryonic cells to differentiate into certain bones.” Fabbri and others at the Bhullar Lab used 3D morphometric analyses, which visualized patterns of variation in the brain and skull into different groupings based on shared qualities, to examine the skull-morphology and deep history of the brains of Reptilia and Aves. “The forebrain will signal to the frontal, the midbrain signal to the parietal, and the posterior brain regions will signal to the back of the skull,” said Fabbri. The presence of this partition, present in mammals and reptiles alike, means that it has major implications for the morphology of the skull and how it evolves with these parts of the brain over time. The research team also examined different stages of the embryo of various reptiles by taking eggs at different stages of incubation, then looking inside of the shell to examine what the embryo looked like that that moment. This close examination enabled the Bhullar Lab to closely study the link between brain and roofing bones of the skull in early development. 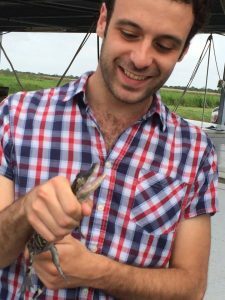 “Logic in developmental biology is very different from how we think with the fossil record, but both have the same aim: to understand why a reptile is like this and a bird is like this; they are simply complementary ways of approaching the question.” said Fabbri. While the fossil record has long been used to frame the evolutionary relationship based on morphological differences at a macro-level, comparative embryology allows for the developmental level of relation to be addressed in evolution. The Bhullar Lab also used CT scanning—which combines many X-ray measurements to create an cross-sectional image of an object without cutting into it—to examine the bone-to-brain relationship in embryos for the first time. 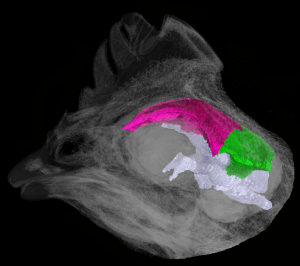 Despite the physical differences of an alligator, lizard, and modern-day chicken, this technology simultaneously visualized and compared their developing brains and skull roofs, revealing that they all share the same developmental pattern. All three taxa showed direct, one-to-one correspondence between the developing forebrain and midbrain with the earliest stage of development of the frontal and parietal (roof and sides) bone areas of the skull. For every degree of development by the brain, the skull develops to the same extent. This one-to-one correspondence in embryos between major parts of the brain and early skull-roof elements’ developments shows that the nature of the relationship between the brain and skull shifts during avian lineage evolution. Previous studies assumed that the avian frontal had a fused origin that caused the resulting shift in avian skull-roof element identity. These findings collectively support the notion that the brain is important in patterning the skull roof. Not only did Fabbri and the Bhullar Lab find that there was there a shift in morphology and relative size to skull from reptiles to birds, but also in allometry of the brain and skull. Allometry is the proportional change relative to body size—specifically the brain and skull in this case. In this case, there was negative allometry between the brain and skull during development of reptiles, meaning that the brain is relatively large in early developmental stages, then becomes smaller with respect to the skull during growth. Birds, on the other hand, exhibit positive allometry with a large brain at the hatching stage relative to the skull; the brain continues to expand during development into adulthood. “This also shows that brains in Aves are peramorphic,” Fabbri said, meaning that although birds retain juvenile cranial characters observed in dinosaurs and other reptiles, at the same time, they also exhibit positive allometry in brain development. Such differences in development also cause the evolutionary differences between birds and reptiles to become more pronounced in the tree of life. Combining the developmental research approach with the fossil research approach could be difficult at times. “We needed to create comprehensive and inclusive data, but also needed to be careful.” said Fabbri. “It can be easy to misinterpret data in the direction that you were going for.” Nevertheless, after many correlation tests, the statistical support was strong behind the embryo’s one-to-one correspondence between skull and brain development, showing their co-developmental relationship. While the fossil record is useful for examining morphological similarities and differences across species, it leaves out gaps in comparative morphology and can sometimes lead to mistakes in research. This research’s use of both comparative embryology and the fossil record more broadly serves as a reminder to interpret developmental data within a phylogenetic framework by fossil records or comparative morphology to determine homology as a whole. Officially recognizing the link between the skull and brain patterning in reptiles and birds is a significant step in understanding how certain morphologies have developed in reptiles and birds. However, the fact that bird brains continue to grow further over the course of their lifetimes compared to other reptile brains may be due to bird-specific adaptations such as flight. The research also represents a larger statement about evolution itself. “Ultimately, this shows that evolution is simple and more elegant than it seems.” Bhullar said. “Now that we have this mapped out, we better know where to look for gene expression responsible for these changes.” The next stage in research may seem more complicated with a new lens at the genetic level, but the combination of fossil records and developmental biology methods and spirit of collaboration in asking these big questions are sure to lead to even bigger answers in the future. Sarah Adams is a prospective Ecology & Evolutionary Biology major in Morse College ‘20. The author would like to thank Matteo Fabbri and Professor Anjan Bhullar for sharing their time for this article. Fabbri, Matteo, et al. “The skull roof tracks the brain during the evolution and development of reptiles including birds.” Nature Ecology & Evolution, vol. 1, no. 10, Nov. 2017, pp. 1543–1550., doi:10.1038/s41559-017-0288-2.